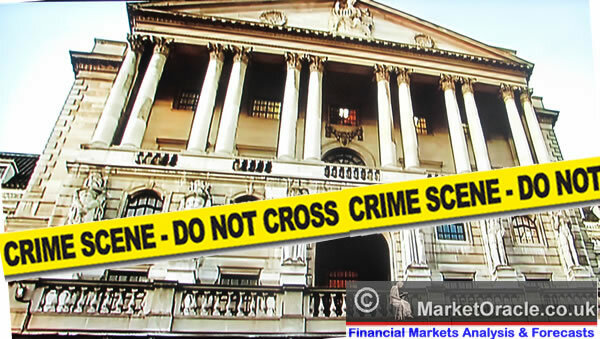 The current unemployment rate is 7.8%, and the BoE forecasts it will take 3 years to get it to 7%, therefore Mark Carney today announced that the policy of near zero interests will remain for at least another three years so as to to finance government deficit spending (debt interest), continue to funnel cash into the banking crime syndicate, and force the increasingly depressed savers to throw in the towel and go on a spending / consumption binge in an attempt at inflating the economy through the services sector so that many millions more low paid service sector jobs (wage slaves) can be created so that the government and the Bank of England can claim success at having reduced the unemployment % rate, because they know that it is impossible for Britain to create high paying manufacturing jobs in any significant numbers due to intense competition from Asia at near 1/10th Britain's wages, and as a consequence of technological advances such as robotics which means that there will never again be the level of demand for blue collar workers as there was up until the mid 1970's, as factories will continue to become more automated, thus the trend will continue towards requiring fewer and fewer high paid manufacturing workers. 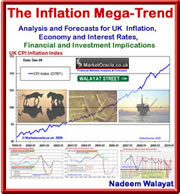 The following graph of official CPI inflation rate (that tends to under report real inflation by between 1-1.5% per annum) illustrates the exponential inflation mega-trend in motion that asset prices tend to be leveraged to and oscillate around and hence one of the primary mechanisms of how the elite accumulates wealth, whilst the effect on the wage slaves is to continuously lose purchasing power of net earnings (after taxes) thus forcing workers to take on debt and thus become reliant on political bribes (benefits and entitlements culture) and perpetual debt slaves who will spend virtually their whole adult lives servicing their debts, for instance over 90% of today's graduates will leave university with about £60,000 of debt that they will then be focused on servicing for the next 25 years of their lives. The below table for the cash isa rates as offered by the Halifax shows that savings interest rates crashed directly in response to the Bank of England's Funding for Lending Scheme announced in July 2012, which sought to provide the Banks with cheap money to entice lending to the general public that originally would total an estimated £80 billion over 18 months but which now has been indefinitely extended. The effect of which is that the Banks are able to rely on Bank of England / UK Treasury for funding for loans instead of savings and thus savings interest rates continue to crash. Deposits held in any sub 3% (after tax) savings accounts continue to be systematically stolen. However, it's not all bad news for ordinary home owners, for one of the consequences of debt and money printing is that for the inflation of a new housing bubble. Today's policy announcement for 3 more years of zero interest rates will put added upward pressure on the housing market as sentiment acts in advance of future expected demand, this should not come as any surprise to my readers, as following the end of the UK housing market depression into the start of 2012, I been flagging how the then much hated housing asset classes in the UK and US were presenting a once in a decade opportunity as the embryonic bull markets of 2012 HAVE morphed into the new bull markets of 2013 that I expect will run for virtually the whole of the remainder of this decade, because all the Bank of England and Government can do is print ever more amounts of Debt and Money which inflates asset prices that cannot be printed. Ensure you are subscribed to my always free newsletter to get my ongoing in-depth analysis in your email in box. As a guide of what one could consider doing to protect themselves from the ongoing inflation stealth theft and the outright risk of theft of bank deposits Cyprus style, the following updated table illustrates how my portfolio is trending in terms of asset classes. The big picture implication is that we are witnessing STEALTH economic recoveries in many countries that the clueless academic economists have been failing to recognise for over a year now as they remain largely fixated on non-existant deflation whilst the stealth bull markets rage on. The bottom line is that as a saver, just like you I have no choice, I either take risks with dividend paying stocks and the UK housing market or all of my hard earned wealth will be stolen by the government and the banks. Off course one of the main objectives of ZIRP is to force everyone to spend their savings, then we will all be in the same boat, become reliant on state benefits because the government's stealth tax - inflation will have eroded the purchasing power of our earnings away to nothing, as ultimately the government can always print an infinite amount of money Zimbabwe style with a similar economic and social consequences. Especially as most of the new jobs created will go to more productive and hard working immigrants, whilst the unproductive, lazy, de-evolving unemployable benefits for life class, will largely continue to remain unemployed, the net effect is that for a slow decline in the official unemployment rate, coupled with huge demand for resources created by continuing immigration, therefore expect a much higher inflation rate than most can imagine today. 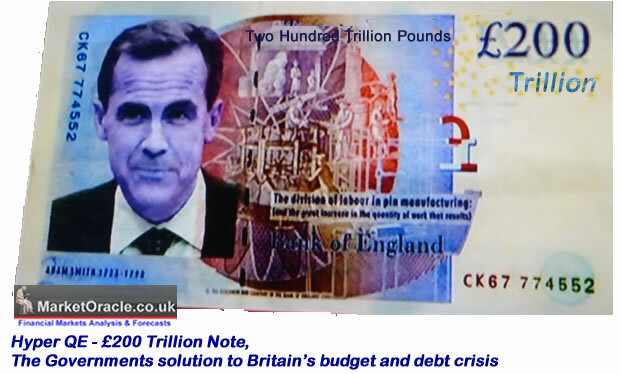 At the end of the day the Bank of England as illustrated by its actions first serves its bankster brethren and then the politicians and hence its policy for another 3 years of ZIRP first benefits the bankster's and then the politicians. Ensure you are subscribed to my ALWAYS FREE newsletter for my next in-depth analysis and concluding trend forecasts. Nadeem, have we any numbers for total new debt both public and private forced into the economy over the last few quarters? The government are posting 0.6% GDP growth or whatever for the quarter but I'll wager that for every £ of GDP they are having to jam well over a pound of new debt into the economy to achieve it, all of which of course has interest attached to it. Any thoughts? Once again thanks for the articles. My next indepth analysis will be on debt and interest rates. My view is that we are in a debt fuelled stealth economic rrecovery AND that interest rates will rise much sooner than most expect so the Bank of England is WRONG! I'll do a short article today, ahead of the main piece that is days away.